Everyone refers to Steve Jobs as the consummate showman. He is the consummate storyteller with “showmanship” just one way to accentuate a given story. I don’t know about “the literary world” but his business storytelling will be missed. So how important was “the story” in Apple’s 14-year run since Mr. Jobs retook the CEO reins? Ironically, he was just getting on a roll with the 1984 launch of the Mac and the Super Bowl commercial that screamed “nana nana nana” to IBM (I think they said it three times, but don’t quote me on this) before the board showed him the door. If you believe the Apple brand represents one of the company’s greatest assets — and how can you not with one study putting its value at $153B — then logic would hold that Mr. Jobs’s storytelling played a critical role in building equity in the brand and the company’s overall success. While “insanely great” is a nice of turn of a phrase, his power in storytelling wasn’t about the words. Like many things at Apple, both classic techniques and deviations from the norm underpin the storytelling. For starters, Mr. Jobs and his kingmakers positioned Apple as an alternative to the establishment. This point got hammered home during the Super Bowl commercial mentioned earlier. OK, nothing terribly original about this. Shoot, the “Cool Hand Luke” DVD still sells 40+ years later. And it’s fair to say that Mr. Jobs was one of the few CEOs to embrace visual storytelling. You could develop a semester’s curriculum around the images that launched the iPhone. But here’s where the script starts four-wheeling. Apple created scarcity in its communications before Julian Assange got the religion. Steve rarely spoke with journalists and when he did, he traded access for control of the story. His fellow executives also stayed out of the public spotlight for the most part. New product details were guarded with the fervor of the guy in charge of answers for Johnny Carson’s Carnac shtick. What happens when you want something and can’t have it? You think about it. You fixate on it. You try to figure out how to get it. 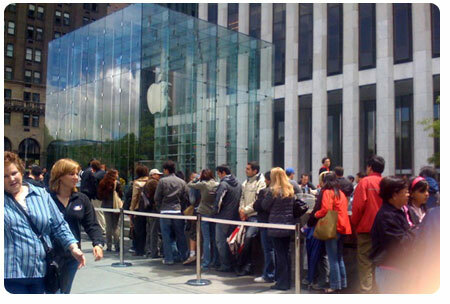 Scarcity created this very dynamic with journalists and customers. Such a backdrop enabled Mr. Jobs to create anticipation and ultimately drama for Apple’s product introductions. There was almost a heroic quality to Apple’s new products, short of stepping into a phone booth and slipping on a cape. All of these qualities marinated over time to make for storytelling that was distinctly Steve Jobs. I defy you to find another CEO who brought all these qualities together under the big top. The countless articles on Tim Cook point out that the Great One himself has already blessed Apple’s product roadmap that extends out a good two to three years. So the thinking goes, it will take this long before Mr. Cook’s first true test will come, when he alone must divine the desires of the people and align Apple’s product direction accordingly. His first challenge will come during Apple’s second major product introduction in the post-Jobs era. For the first one, the mere fact that Steve won’t be there guarantees rich storytelling. It’s the second product intro when we’ll get a sense of how Tim Cook intends to shape the Apple narrative going forward. That should make for an interesting story indeed. Appreciate you dropping by the neighborhood.